Off to Cambridgeshire once again for another Cup Final on a Friday night the 3rd in the space of 10 days featuring Cambridge United WFC, their Reserves in action aiming for a cup double as they faced Netherton United Ladies, reaching their 1st ever final the Cambridgeshire Women's League Cup. Both sides currently 1st and 2nd in the Cambridgeshire Women's Premiership. A new format for the Cambridgeshire Women's League Cup sponsored by S-Tech Insurance this season. The early rounds played as a Group format as a pose to knockout the teams across the 3 leagues, Premiership and Championship North and South drawn into 8 Groups of 3 to 4 sides each playing the other once with the overall winners advancing to the quarter finals. At least one Premiership team in each with the others either from the North or South Championship. For the 3rd successive season Cambridge United WFC Reserves have reached both the Junior Invitation Cup Final and League Cup Final have gone on to win the Junior Invitation Cup then ended up as runners-up in the League Cup. Want both this time around have defended the Junior Invitation Cup against the side they met in the group stage, Cambridge City Ladies Development winning that match 2-1 it was enough to progress as the other side in their Group, Great Paxton Ladies withdrew from the league despite winning the only league game they ever played 6-0. Awarded the home win Cambridge United WFC Reserves topping the group faced tough and familiar opponents Cambridge University Women at home in the quarter final, a single goal scored by Lucy Gateson seeing them into the semi-finals, where they were drawn away to another Premiership side St Ives Town Ladies a 2-0 win putting them into another League Cup Final. 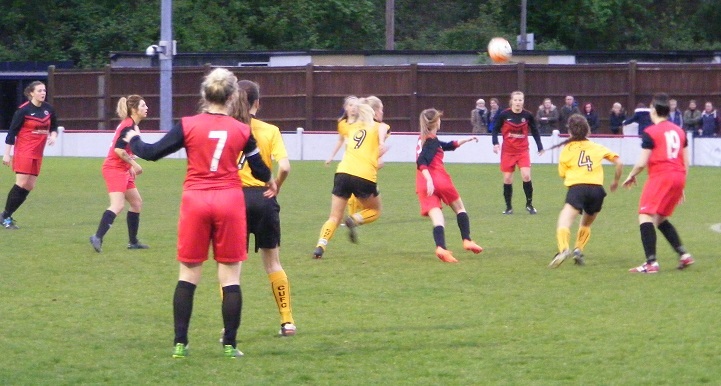 Peterborough based side, Netherton United Ladies are into their 1st ever cup final. Were drawn against Championship North sides Wisbech Town Ladies, Ketton Ladies and Spalding United Ladies. A crushing 10-1 win at home to Wisbech Town Ladies saw them take control of their group early on, awarded wins against both Ketton who were struggling for numbers at the time and Spalding United who withdrew from the league progressed to the knock out stages. 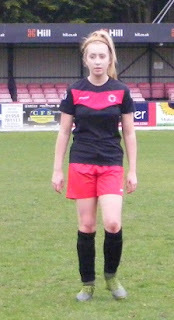 At home to another Championship North side Wisbech St Mary Ladies in the quarter finals a brace from Emily Johnson along with a goal for Megan Strickland saw them advance into the semi-finals with a 3-0 win. By the time the semi-finals came around Netherton United Ladies were in a good vein of form moving up the league table as they entertained fellow Premiership side Bar Hill Ladies at home a 5-0 victory putting them through to their 1st ever final. The League Cup Final venue Histon FC's Glassworld Stadium the pitch holding up well firm of course from the dry weather has seen plenty of action recently. Coming into the game off the back of 3 hours sleep from last nights trip down to Kent I needed refuelling the kitchen open a cheeseburger just what I needed. Little overcast but humid the floodlights on as the sides entered the pitch, decided to watch the 1st half from the opposite side to the main stand basically because I've never done it before. 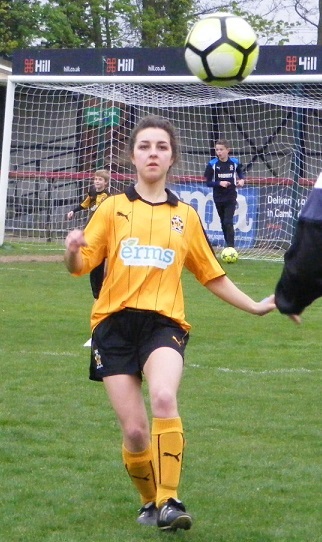 Cambridge United WFC Reserves starting XI - Sarah Carroll, Emily Ingle (C), Holly Northfield, Liz Pamplin, Carolyn Sarafian, Tahnee Perfect, Gabrielle Whitehurst, Lucy Gateson, Teonie Peyton, Ebony Rule & Lauren Gibson. 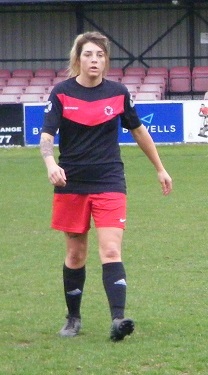 subs - Kirsten Burt, Emma Roberts, Claire Kilmartin, Faith Hewitt & McKenzie McGranor. Netherton United Ladies starting XI - Katie Cooper, Lucy Johnson, Dita Upesjure, Hannah Johnson, Jenna Nairn, Megan Strickland, Natalie Gaches, Megan Parrett (C), Alice MacNicol, Yasmin Green & Emily Johnson. It's Cambridge to kick-off the 1st half of the League Cup Final wearing Amber shorts and socks with black shorts. Netherton kitted out in red shirts with black across the upper chest and sleeves, red shorts and black socks. Both sides look to play the ball long into heir wide players early without any success. Netherton captain, Megan Parrett brings the ball into the Cambridge half on the right lays the pass into Emily Johnson in the middle she looks to lift the ball up into the box with Yasmin Green making the run over the top, Cambridge centre back Carolyn Sarafian gets across her shield the ball for goalkeeper Sarah Carroll to gather. Cambridge long to put the ball up field with both strikers Lauren Gibson and Ebony Rule on the move looking to get in behind, Netherton goalkeeper, Katie Cooper comes racing out of her box to clear the ball, misses it however the defence tracking back reach the ball first put it behind for a corner. An inswinging ball from Teonie Peyton on the right Netherton head clear at the near post. Another opportunity for the Cambridge attackers to get onto the ball outside the Netherton area play on the left Lucy Gateson with Tahnee Perfect the ball is slid through to towards the area left of goal both Gibson and Rule go after it, Netherton centre back Jenna Nairn manages to get in between the pair do enough to put Rule off as she goes to shoot the ball going out for a goal kick. An open start from both sides getting the ball moving Cambridge sitting deeper than Netherton their is room in behind Cooper prepared to come out of her area if needed. Perfect brings the ball out from the back as Cambridge break up a Netherton attack through the middle moving left sends the ball up the line with Gibson looking to run clear, Hannah Johnson comes across and diving in to tackle puts the ball out for a throw. Squeezing play in the final 3rd Cambridge the cross is swept in from the top of the area racing in from the right Peyton meets the ball as it drops a pointblank save from Cooper in front of her inside her six yard box blocking the ball it falls to the floor, Peyton tries to hurdle the grounded keeper to reach it turn it over the line, Cooper getting hurt for her efforts claims the ball. Netherton bring the ball down the left Alice MacNicol is brought down awarded the free-kick players go forwards into the box sent long towards the far post the ball is knocked back into the middle Megan Parrett under the ball, Carolyn Sarafian gets her head on the ball 1st knocking it ybehind for a corner kick. An inswinging ball from the right is a great delivery flashing across the face of goal no one can find the touch needed to put it home as it runs wide. Rule plays a great ball forwards into Gibson's path in behind again through the middle Cooper comes a long way out of her area to meet her closing in on each other the ball deflects between the pair is behind everybody for an instance, Gibson would have been through to run the ball into an empty net only the striker has lost sight of the ball allowing Netherton to get back at her as she finds it plays it out to Peyton right side, Hannah Johnson across to put the tackle in play the ball out for the throw. A clumsy challenge from Sarafain on Emily Johnson gives Netherton a free-kick 30 yards from goal, Nairn over the ball sends in up in towards the top of the area Sarafain with the winning header for Cambridge a counter attack is launched Perfect up to Gibson looking to run in behind, Hannah Johnson gets across her inside the box sees the ball safely back to Cooper. MacNicol is clipped as she looks to drive down the left for Netherton. The free-kick is played in towards the near post Carroll starts to come for it but dropping short of the keeper Emily Johnson throws herself at the ball as it lands only succeeds in prodding it safely into the Cambridge goalkeepers gloves. GOAL! Getting the ball into the corner on the right Cambridge win a corner kick players coming up from the back as Peyton prepares to take a great inswinging ball into the centre of the six yard box Liz Pamplin gets up to head the ball goes back out towards the near post area, Rule jumps to meet it heading the ball back across the keeper to opening the scoring in the League Cup Final 1-0. Netherton look for an immediate response from the restart getting the ball down the left win a corer kick, the delivery towards the top of the area Sarafian heads away, Nairn gathers right side plays a high ball back into the box, Carroll unchallenged takes the ball above her head. Play is stretched across the pitch Gabrielle Whitehurst out to Peyton on the move down the right wing squares the ball into the Netherton area Gibson a yard inside gets her head onto the ball but a long way out lacks power bounces as Cooper brings it into her gloves. Challenging for the ball inside the Cambridge half Nairn wins possession lifts it up towards the top of the area dropping in behind the Cambridge defence, Megan Parrett turning in behind gets her outstretched foot on the ball sending it up past the advancing keeper, her effort landing on the roof of the net. Lucy Johnson gets forwards on the right to support Parrett the ball off a throw in is played into the area, Green looking to get on the end of it the ball is won back by Sarafian. GOAL! Cambridge go on to double their lead Gateson bringing the ball on inside then forwards for Gibson breaking clear on the left, Cooper comes rushing out to the corner of her area slides in blocking the ball before Gibson with her legs it screws in behind however, Gibson past the stranded keeper keeps her composure as the Netherton defence rush back to defend their goal, picks her spot sending her shot between them to make it 2-0. A good spell spell for Cambridge the ball played up to Rule back to goal right side outside the ball lays it off into Whitehurst coming forwards plays the past right into the box with Peyton looking to get onto the end of it, Hannah Johnson blocking her shot deflects across goal to the far post retrieved by Gateson, Lucy Johnson closes her down as she tries to turn back inside for a shot the full back winning the ball. Rule is played through on the left side carrying the ball into the the area shapes her body to send a shot away, Dita Upesjure gets across to block in the nick of time. Lauren Johnson comes on for Netherton late in the 1st half going up top. Cambridge looking the more likely to score however as they get the ball into Gateson on the left wing puts it forwards to Rule inside the box left of goal taking the ball down well sends her shot in towards goal, Cooper getting down low makes the save. Holly Northfield with a great tackle to break up Netherton's attack on the right Parrett looking to play the ball inside with Emily Johnson coming for the ball. 3 minutes of added time in the 1st half. Gateson is allowed to run with the ball in the closing moments for Cambridge left side turned infield looking to shoot as she reaches the box, Nairn comes in to make the blocking tackle to deny her. 2-0 the lead for Cambridge United WFC Reserves at half time have been the better side as the half moved on defending deep their isn't much space for Netherton to exploit, MacNicol left and Parrett right starting their attacks from deeper positions have found the Cambridge defence a tough nut to crack. A high line up the other end Netherton's defence is quick to recover the ground. 2 nil down think it was vital Netherton didn't concede a 3rd before the break. Netherton to get the 2nd half underway have made a change at the break, Georgina Parrett on for Natalie Gaches. A quiet start defences dealing with long passes sent forwards. Upesjure with a strong run on the ball down the left side, Cambridge captain Emily Ingle in to make the tackle. Coming forwards with the ball Megan Strickland plays the ball in the diagonal left to right with Georgina Parrett on the move knocks the ball back inside towards Megan Parrett looking to line up a strike from 20 yards out Cambridge are quick to close her down. Coming on again Netherton attack down the right Lauren Johnson the player this time picking out Megan Parrett inside her a little further out this time leaning back as she strikes the ball gets her attempt on target but straight at Carroll who holds onto the ball. A bright start to the 2nd half from Netherton as they look to reduce Cambridge's lead. Sitting a little deeper in the 2nd half the Cambridge attackers finding less room, get the ball out to the left and win a corner kick. A 2nd change for Cambridge after they extend their lead bring of Sarafian who has appeared in all 3 of Cambridge United WFC's finals for both the Reserves and 1st team, send on Claire Kilmartin to join the defence. A blow for Netherton conceding from a 2nd corner kick early in the 2nd half. Cambridge get the ball forwards Perfect doing well in the midfield out to Rule drifting left side, Peyton central as the ball crossed in controls with her head, Lucy Johnson close on her wins the ball as it drops. Georgina Parrett has made an impact since coming on 2nd half, taking the ball on into the box right side fires a cross/shot through the six yard box, no one able to connect far post. Peyton comes off for Cambridge as they bring in Kirsten Burt. An open match Netherton pushing on Megan Parrett central now looking to feed the ball into Lauren Johnson, Northfield tackling plays the ball into Perfect on for Hewitt tries to send Gibson away down the left channel is quickly closed down by Lucy Johnson. A shot from the top right corner of the box from Burt, straight at Cooper a good height for the keeper to take. Perfect drives forwards on the ball has Burt on the move to her right as she closes in on the box, Upesjure in between the pair is well placed to intercept the pass. 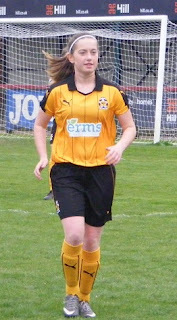 Emma Roberts in introduced from the bench for Cambridge coming on to replace Pamplin in the centre of defence. Gateson and Georgina Parrett tussle for the ball on the right as Netherton attack, Gateson left bemused as the free-kick goes against her. A chance for Megan Parrett to play the ball into the box sends in long towards the far post is met by Georgina Parrett who stabs the ball wide across the face of goal. Cooper does well coming forwards to pluck the ball off Rule's head as looks to bring a diagonal ball put in from the right under her control. Netherton push players on looking to find a goal, Nairn looks to hit a shot in towards goal as the ball runs across her path outside the box, a low drives swerves inwards Carroll getting low traps the ball. Cambridge bring Rule off, McKenzie McGranor coming on. Emily Johnson pushes forwards with the ball left for Netherton has MacNicol on her outside giving her the ball goes on into the area getting the return ball leaning back as she goes to strike it sends her shot up over the crossbar. MacNicol's last action of the game as she is substituted, Green coming back on. Emily Johnson sends a high ball up into the box from the right, Lauren Johnson central gets in between Northfield and Carroll as the ball drops, the keeper doesn't gather as the ball drops to the right Johnson after it has to turn inside doing so drags her shot wide of the near post from 8 yards out the keeper getting across to cover the post can't be sure makes the save. Cambridge with a corner up the other end put long from the left the ball cleared Netherton look to clear their box, Cambridge retrieve the ball put out to Burt on the right fires the ball in towards the near post area, the defensive clearance is missed the ball coming at Gibson quickly inside the six yard box sends her snap shot up over the bar. A double change for Netherton Natalie Gibbs and Carmen Giles sent on for Strickland and Upesjure as the game moves into the final minutes. Peyton returns to the field for Cambridge after a knock for Northfield. 4 minutes of added on time. A good take for Cooper inside her six yard box with McGranor closing in looking to get onto the end of Gibson's cross as she takes the ball away to the right. Emily Johnson spins in behind for Netherton on the right looks to put her cross central for Lauren Johnson Kilmartin cuts out the cross, the ball cleared by Roberts. Netherton push all the way to the end but the Cambridge defence hold firm. 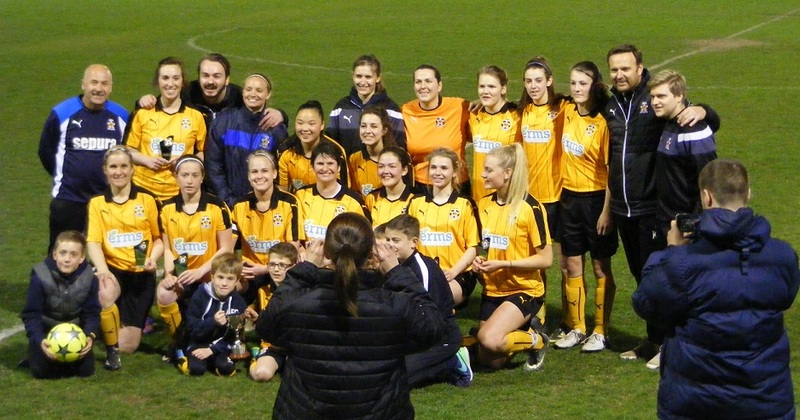 The final whistle blows and Cambridge United WFC Reserves complete a cup double winning a 3rd trophy for the club in the a space of 10 days. An entertaining final, open play with both sides attacking, Cambridge happy to absorb Netherton's attacks in the 1st half exploit the space left in behind. Leading 2-0 at the break a 3rd goal was always going to be needed just to be sure as Netherton pushed early 2nd half for a reply, Cambridge extended their lead from a 2nd goal from a corner. A good advert for football in the county played in a good spirit. There are a few contenders for tonight's SWF Blog - Player of the Match award, had it down to 3 names, a good performance at the back from Sarafain for Cambridge, also Perfect with some great link up play and passing in the middle. In the end though I've chosen striker Ebony Rule worked really hard especially 1st half to use the room ahead of her, link up with Gibson and come back to receive the ball along with being in the right place to score 2 goals in the League Cup Final. Always a busy end to the season for the County FA's and in Cambridgeshire, Chris Abbott along with the rest of their team do a great job their help is always appreciated.